Instagram ideas, tips and tricks for businesses and events. Download our social media guide for your store to make the most out of its online presence. We develop solutions for your store to be a success in social media, let’s talk! Download our social media guide for your education center to make the most out of its online presence. 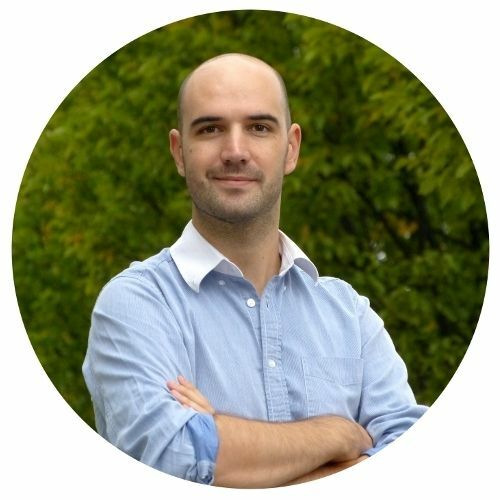 We develop solutions for your education center to be a success in social media, let’s talk! Step by step guide to learn how to display Instagram videos on screens with our free Instagram wall application. First of all, connect your PC or laptop to your screen using a HDMI or RS-232 serial cable and make sure that you can display the content of a web-browser on it. Yarr TV allows you to display Instagram videos on screens for free: access https://www.yarr.tv/create/yarr-tv/ and enter a hashtag such as #instavideo, add your email address and click on CREATE MY FREE YARR TV BASIC. Just click on PLAY FULL SCREEN and PLAY to start streaming real-time Instagram videos on your screens. We develop solutions to boost the reach of your posts on Instagram, let’s talk! Step by step guide to learn how to display Instagram photos on screens with our free Instagram wall application. 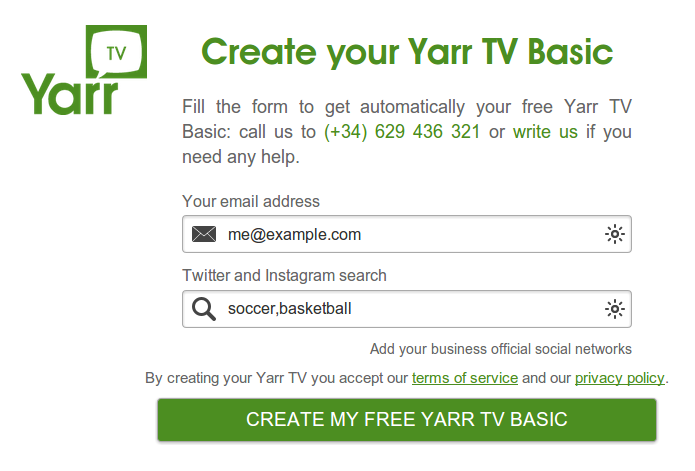 Yarr TV allows you to display Instagram photos on screens for free: access https://www.yarr.tv/create/yarr-tv/ and enter a hashtag such as #soccer, add your email address and click on CREATE MY FREE YARR TV BASIC. Just click on PLAY FULL SCREEN and PLAY to start streaming real-time Instagram photos on your screens. Step by step guide to learn how to display Instagram searches on screens with our free Instagram wall application. 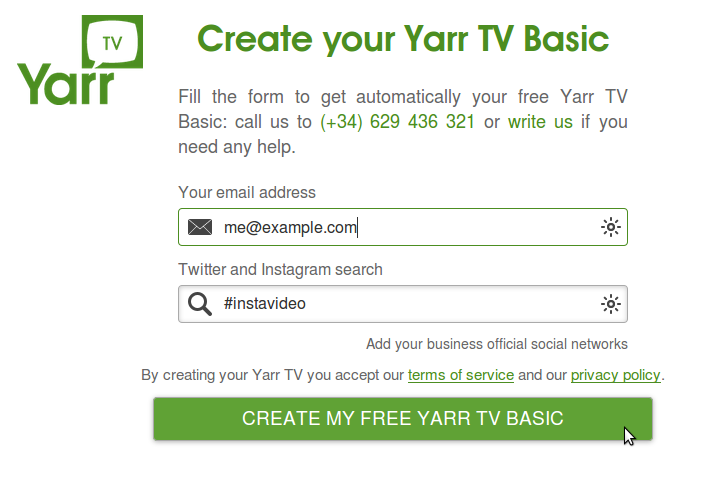 Yarr TV allows you to display Instagram searches on screens for free: access https://www.yarr.tv/create/yarr-tv/ and enter a search of 2 words such as soccer and basketball separated by a comma, add your email address and click on CREATE MY FREE YARR TV BASIC. Just click on PLAY FULL SCREEN and PLAY to start streaming real-time Instagram searches on your screens. Step by step guide to learn how to display Instagram hashtags on screens with our free Instagram wall application. 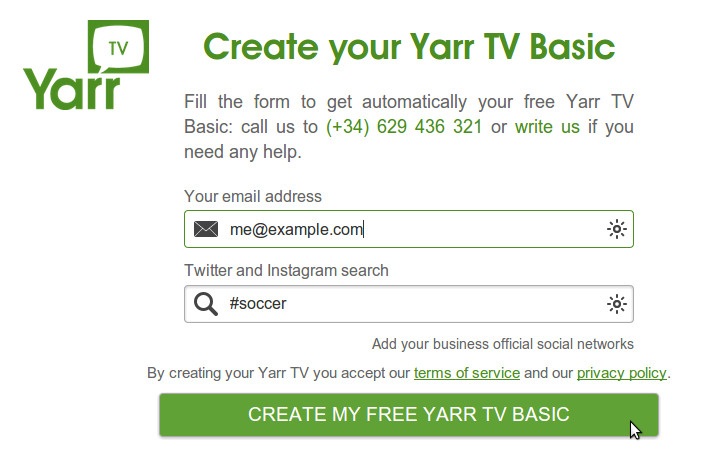 Yarr TV allows you to display Instagram hashtags on screens for free: access https://www.yarr.tv/create/yarr-tv/ and enter a hashtag such as #soccer, add your email address and click on CREATE MY FREE YARR TV BASIC. Just click on PLAY FULL SCREEN and PLAY to start streaming real-time Instagram hashtags on your screens. Step by step guide to learn how to create and setup an Instagram wall for events with our free application. Yarr TV allows you to display Instagram photos and videos on screens for free: access https://www.yarr.tv/create/yarr-tv/ and enter a hashtag such as #soccer, add your email address and click on CREATE MY FREE YARR TV BASIC. Just click on PLAY FULL SCREEN and PLAY to start streaming real-time Instagram photos and videos on your screens. Step by step guide to learn how to project hashtags at events with our free social media wall application. Yarr TV allows you to display social media hashtags on screens for free: access https://www.yarr.tv/create/yarr-tv/ and enter a hashtag such as #soccer, add your email address and click on CREATE MY FREE YARR TV BASIC. Just click on PLAY FULL SCREEN and PLAY to start streaming real-time social media content on your screens. 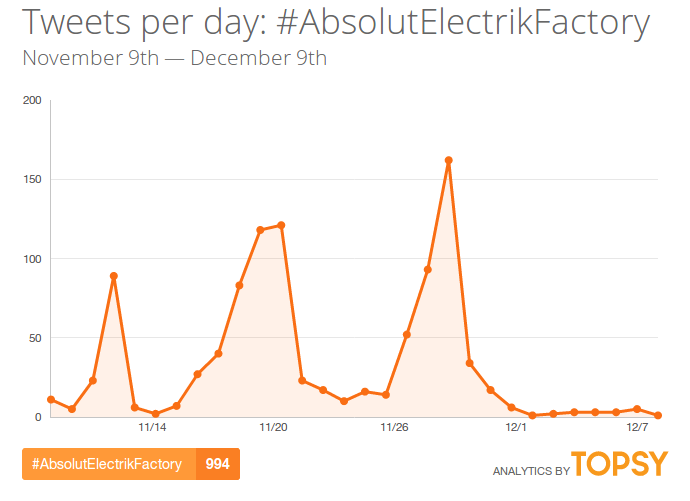 We develop solutions to boost the reach of your event on social media, let’s talk! 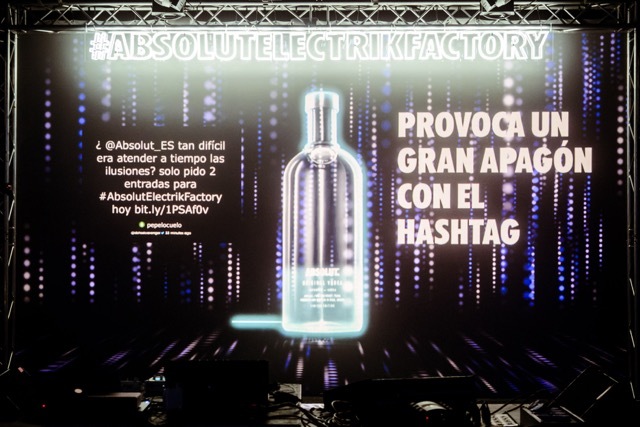 #AbsolutElectrikFactory event was celebrated between the 19th, 20th, 27th and 28th of November in Madrid and brought together a big number of electronic music fans. Yarr TV socialwall boosted the brand’s hashtag by projecting tweets and Twitter and Instagram photos of the attendees on the screens of the events. If you missed this event, you can watch a summary in the following video. We develop solutions for your branding event to be a success in social media, let’s talk!